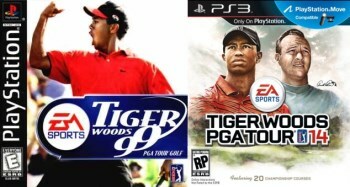 PGA Tour golf games from EA Sports will no longer bear Tiger Woods' name. The very first Tiger Woods PGA Tour title came out of EA Sports in 1998 - very likely before some of you were born, in other words. That's an awfully long time for an endorsement deal of any kind, but after 16 games spread over 15 years, the relationship has finally come to an end. "EA Sports and Tiger Woods have also made a mutual decision to end our partnership, which includes Tiger's named PGA Tour golf game. We've always been big fans of Tiger and we wish him continued success in all his future endeavors," the publisher said in a brief announcement. "Moving forward, we will continue to work with the PGA Tour exclusively to create groundbreaking golfing titles and our partnership remains strong." Electronic Arts made a point of standing by Woods during the scandalous collapse of his marriage, during which many of his major sponsors cut ties with him, but by the end of 2010, with sales of PGA Tour 11 down dramatically over the previous year, then-CEO John Riccitiello made what many took as a veiled threat about the future of their relationship. "We have no plans to move away from him, but it's a business relationship on the basis of we make the best golf game and he's the best golfer," Riccitiello said. "Both of those things need to be true in the long run for the partnership to make sense." The final game to bear Woods' name, Tiger Woods PGA Tour 14, came out in March of this year.